usually on canes from the preceding year. 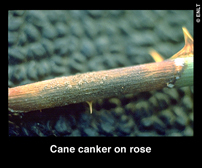 The affected canes die back. Cause: Soggy soil, unbalanced fertilizing. Often affects shrub and climbing roses. Prevention: Drainage and good soil aeration. Fertilizing less promotes soil life. Treat any wounds with wound paint and check for ideal location.